What alternatives are open to you if you have a broken leg, sprained ankle or leg surgery and you just don’t want to use a pair of crutches or be confined to a wheelchair? The perfect option is a knee scooter. 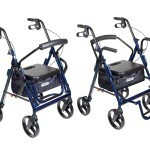 Knee scooters are also known as knee walkers, leg scooter, or a knee roller. These are our 11 favorite 3 and 4 wheel scooters which are stable, easy to maneuver and best of all give you that much need independence! 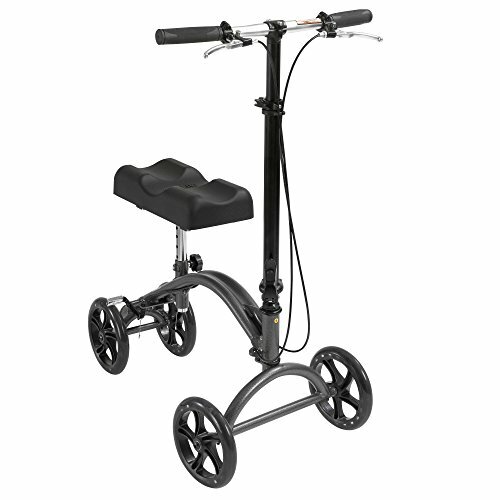 A good quality knee scooter offers stable, safe freedom of movement for people who have suffered below the knee injuries. 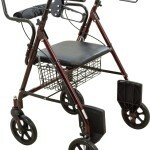 They work to continually support the injured leg in a comfortable and non-weight bearing position. The unique design of the scooter elevates the leg, reducing any possibility of placing weight on the foot and accidentally damaging it further. Crutches don’t offer the same level of stability and can easily catch on uneven ground, plus they can strain your upper back, shoulders and chest muscles. As a patient, you get to enjoy far greater mobility and live your life with fewer limitations as you are not dependent on everyone else to help. They are an excellent option for using on a variety of surfaces from smooth to rougher terrain, leaving you feeling confident you won’t catch your foot and trip over! A major benefit of using a knee scooter is less upper body strength is required to keep the user in an optimal and natural upright position. They are so simple to use and much easier to manipulate than traditional crutches. If you specifically are wanting a 4 wheeler over a 3 wheeler for added security, we take a close look at these 5 most popular models here. Knee scooters look rather like a child’s push scooter, or trike and are available in either 3 or 4 wheel options, and with, or without handbrakes. 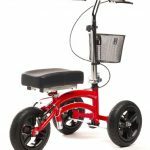 You can choose from a wide range of colors, black, red, blue, purple , chrome….Which knee walker you choose depends on your personal circumstances and how active you need to be. 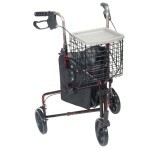 You can check out how to use a knee walker safely here. Hint- they are super easy to use and surprisingly speedy! 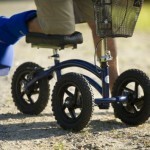 3 wheel knee scooters are preferable for greater turning manoeuvrability and agility. They are less stable than a 4 wheel knee scooter. 4 wheel scooters offer greater stability and are often larger in size. They can travel anywhere in doors and are a perfect choice when visiting the shopping mall, or going to entertainment events. The soft padded cushion supports the injured leg, ankle or foot. Some devices have shaped cushion to securely rest your lower leg. Some feature soft fluffy sheepskin covers. To make life easier, the knee pad should feel comfortably supportive, fit the size and shape of your lower leg, along with the option to adjust the pad up or down to the correct height for your height for stable balance. 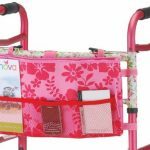 They are super easy to transport as they are lightweight and fold up in seconds to fit into the car. Prolonged use of crutches can cause strained muscles under the arms, across the back and shoulders which is just plain uncomfortable and may require physio work to stop the pain. Using crutches means using your hands to hold the crutches in place any time you need to walk around or go to the toilet. There is no strain on the lower leg as it is safely supported. There are far fewer possibilities of accidental damage, plus the injury will heal faster as leg is in a relaxed position. You can get around much faster on knee scooter than a pair of crutches. You can actually zip along on a scooter quite fast once you get the hang of using one, without any physical strain which you just can’t do using cumbersome underarm crutches! A knee scooter travels over the majority of ground surfaces easily as they have been designed with larger wheels to offer manoeuvrability. Using a knee scooter conserves physical energy. 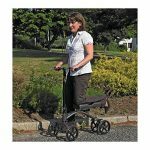 Considerably less energy goes into using a scooter as you are not physically lifting a pair of crutches up and down to move forward, sideways or backwards. You simply push the scooter along like a skateboard and glide in the direction you want to go. Most knee scooters will come with a basket where you can store your shopping or personal items when you go out. If they don’t, they are always available on Amazon to buy. 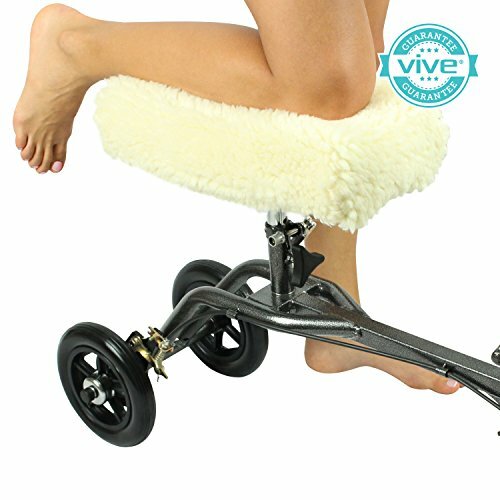 Knee scooters are a good alternative for people with diabetes and plantar ulcers to elevate the foot to help heal the ulcer and not plasters or be confined to bed rest. In short, to sum up the reason why you would consider a knee scooter: Freedom, Ease Of Use and Stability. When you are recovering from a broken ankle, a sprained ankle or lower leg surgery of any kind, one of the most frustrating aspects of the healing phase is the inability to do as you want, when you want! A knee walker gives you the freedom to scoot over all sorts of surfaces safely, and once you get used to your knee walker, you will be surprised at how user friendly they are. There is also a good resale market, something to keep in mind. Do your research on your chosen knee scooter, read the reviews and watch YouTube video’s to help you choose the right one to look after yourself. I agree. Knee scooter is good choice when we have problem with our angle or knee. yes, they are and its amazing how fast you can get around too. On flat ground, you can give kids on scooters a run for their money if you were inclined to…. The maneuverability aspect is great with very tight turning circles, making it easy to get around anywhere. A far better option than crutches in my opinion!